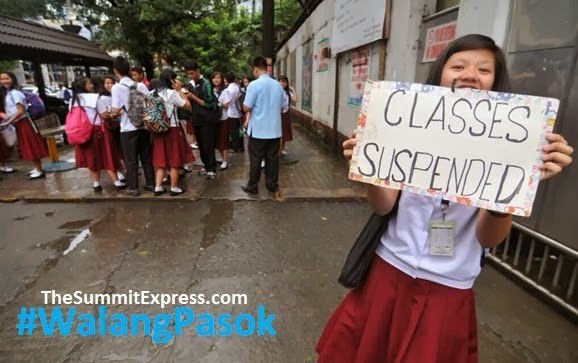 MANILA, Philippines - Some local government units (LGUs) and schools announced class suspensions for tomorrow, July 7, 2015 (Tuesday) due to the effects of Tropical Storm 'Egay' in the country. The advisories were released through social media on Monday night. State weather bureau PAGASA on Monday afternoon said that 'Egay' continues to move northward slowly and is expected to exit PAR by Thursday evening (July 9). PAGASA raised Public Storm Warning Signal No. 1 (30-60kph Expected in 36 hrs.) over Ilocos Norte, Ilocos Sur and Abra, Batanes, Calayan and Babuyan group of Islands, Northwest of Cagayan and Apayao. On Monday, Malacañang Palace has suspended work in all government offices and classes in all levels, public and private in the National Capital Region (NCR). Local governments in North Luzon also announced class suspension because of heavy rain and flooding brought by Egay.